​​ HOUSTON – Consumers kept the Houston real estate market humming in April 2017, with single-family home sales and pricing experiencing another month of gains and housing inventory reaching the highest level since August 2016. The strongest growth in sales activity took place among homes priced from $750,000 and above, followed by homes in the $250,000 to $499,999 range. 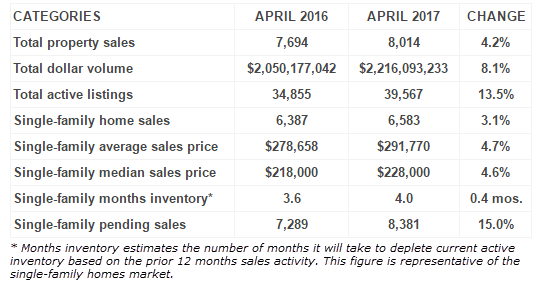 A total of 6,583 single-family homes were sold in April 2017 versus 6,387 in April 2016, according to the latest monthly report produced by the Houston Association of Realtors (HAR). That represents a 3.1 percent increase. The single-family home median price climbed 4.6 percent to $228,000. ​Check out Houston Housing Market Research.